Dr. Harding addresses members with disabilities of the National Eagle Scout Association. There has never been a more important time to understand Americans with disabilities — their challenges, potential, rights and important roles in the world. Dr. Harding’s unique story is timely, relevant and inspirational. He speaks to all audiences (both young and old, professional, and trades). 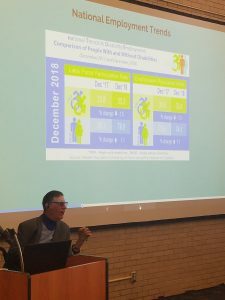 He addresses issues such as employment, diversity, advocacy, independent living, decision-making and workplace strategies – not just for disability groups, but also for employers, government organizations, colleges and universities, and community groups. The unique “JR story” provides lasting inspiration and education for audiences from all walks of life. Dr. Harding is a natural story teller. He is the personification of balance, determination, and persistence. He unfolds his personal tale of triumph with a dramatic style based on his infectious sense of humor and zest for living. He has a charm that enables him to speak on very serious topics. Dr. Harding draws on personal narratives and experiences that punctuate his presentations with honesty, making personal connections to empower children, teenagers, parents, caregivrs, teachers and employers. He often stays after his presentation to facilitate these connections or address individual concerns at no extra cost. He’s motivated by empowering strangers to be captains of their own lives. 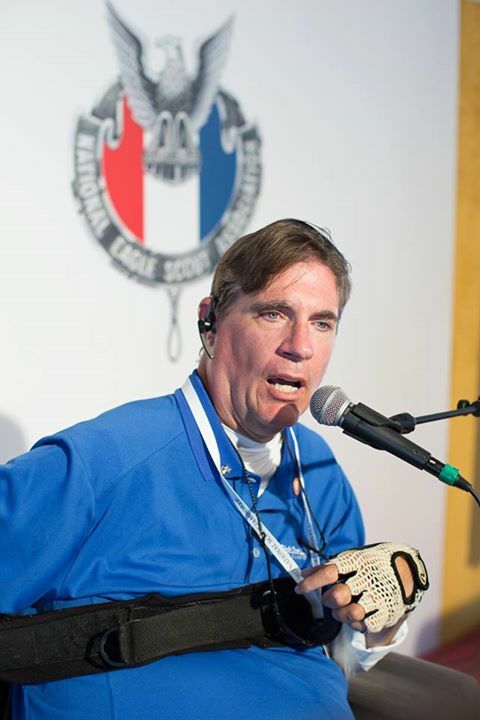 Dr. Harding has been speaking at public events for 25 years to over 250 diverse audiences – large and small (from a Rotary Club meeting to the Australian National Transportation Conference to the 2013 Boy Scout Jamboree with 20,000 scouts and volunteers. Dr. Harding has extensive experience in public speaking. The following history shows his speaking engagements over the last two decades. 2015, October: Florida State University College of Education, Invited Guest Lecturer: “Possibilities of Life.” Tallahassee, Florida. 2015, September: Keiser University OT Program, Invited Guest Lecturer: “Abilities: A Quadriplegic.” Tallahassee, Florida. 2015, September: Florida State University College of Business, Invited Guest Lecturer: “Inclusion: Persons with Disabilities.” Tallahassee, Florida. 2015, June: The Annual Family Café, presenter on Billy Joe Rish Park, the Florida Disabled Outdoor Association (scuba diving demonstration) and Delta Air Lines – Air Travel for Persons with Disabilities. Orlando, Florida. 2015, April: Florida Agricultural and Mechanical University Annual Management Seminar, Invited Speaker: “Now What? My Journey and Persons with Disabilities.” Tallahassee, Florida. 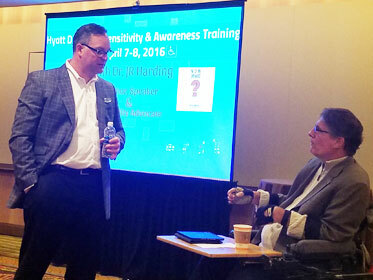 2015, March: International Association of Rehabilitation Professionals Conference , presenter on “Now What? My Journey and Persons with Disabilities.” Petersburg, Florida. 2015, February: Florida State University Special Education classroom, presenter on students with disabilities. Tallahassee, Florida. 2014, November: Phillips High School Annual Teach In event, presenter on possibilities. Orlando, Florida. 2014, November: Broward College Veterans and Persons with Disabilities, presenter. Fort Lauderdale, Florida. 2014, October: Adult and Community Education Students with Disabilities, presenter. Tallahassee, Florida. 2014, June: 16th Annual Family Café , presenter on Billy Joe Rish Park, Traveling with a Disability and Aging in Place. Orlando, Florida. 2014, January: Leadership Florida Program for Class XXXIII, presenter. St. Petersburg, Florida. 2013, November: University of South Florida St. Pete College of Business Walgreens Bayside Business Forum, keynote presenter. St. Petersburg, Florida. 2013, November: Florida State University’s Delta Tau Delta Iris Ball, presenter. Tallahassee, Florida. 2013, November: Elder Affairs Aging in Place Symposium, panel member. Jacksonville, Florida. 2013, October: Disability Employment and Awareness Day, keynote presenter on “What Can You Do?” Panama City, Florida. 2013, September: Orange County ADA Educational Series, presenter on Accessible Gas Stations. Orlando, Florida. 2013, July: Boy Scout Jamboree, main stage presenter on “Scouting for Life.” West Virginia. 2013, June: 15th Annual Family Café, presenter on Aging in Place and Billy Joe Rish Park. Orlando, Florida. 2012, April: 4th Annual Best Buddies Banquet, keynote presenter. Tallahassee, Florida. 2012, March: Harris Rosen College of Hospitality at University of Central Florida, distinguished guest lecturer. Orlando, Florida. 2012, February: Florida Institute of Technology, presenter on “Now What?” Melbourne, Florida. 2011, December: Florida Keys Coalition, presenter on “Now What?” Key West, Florida. 2011, May: 15th Annual Academic Advisor Conference for the University of South Florida, presenter. St Petersburg, Florida. 2010, November: Florida International Association of Rehabilitation Providers (IARP) Annual Conference, presenter on the “JR Story,” Disability Mentoring Day and the Legislature. Tampa, Florida. 2010, October: Annual Community Transportation Organization (CTO) of New South Wales, Australia, keynote presenter on Florida Model. Aubrey, Australia. 2010, October: Annual Guest Lecture Series at the Rosen College of Hospitality (UCF), presenter on “Life, Disabilities & the Hospitality Industry.” Orlando, Florida. 2010, September: Jacksonville Mobility Summit, presenter on Regionalization and co-presenter with Congressman John Mica. St. Augustine, Florida. 2010, June: 12th Annual Family Café, presenter on Agency for Persons with Disabilities (APD) 5-year Employment Plan and The Florida Transportation Model. Orlando, Florida. 2009, November: Association of RV and Campers (ARVC), presenter on Outdoor Mobility. Orlando, Florida. 2009, August: Annual Florida Human Resource (HR) Conference, presenter on “Untapped Workforce” (Persons with Disabilities). Orlando, Florida. 2009, June: 11th Annual Family Café, presenter on “Transportation Disadvantaged: The Coordinating System, Working in the Community.” Orlando, Florida. 2008, June: 10th Annual Family Café, presenter on Billy Joe Rish Park and Disability Mentoring Day. Orlando, Florida. 2007, June: 9th Annual Family Café/Family Collaboration Advocacy Friendship Empowerment Conference, presenter on Planning and Preparing for Obtaining Employment to Gain More Independence.. Orlando, Florida. 2007, May: The Florida Veterans of Cocoa Beach, presenter on the Transportation Disadvantage Program. Cocoa Beach, Florida. 2007, April: The American Association of People with Disabilities Conference, presenter on Florida Disability Mentoring Day Fundraising. Orlando, Florida. 2007, April: The International Association of Rehabilitation Providers Annual Conference, presenter on Why Rehab Professionals Matter. 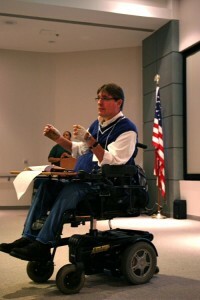 Washington, D.C.
2006, July: The Orange County ADA Accessibility Seminar & Town Hall Meeting, presenter on accessibility issues. Orlando, Florida. 2006, June: 8th Annual Family Café/Family Collaboration Advocacy Friendship Empowerment Conference, presenter on Planning and Preparing for Obtaining Employment to Gain More Independence. Orlando, Florida. 2006, May: The International Association of Rehab Professionals Annual Conference, panel member. Minnesota. 2006, March: Annual ADA Conference, representing the U.S. Access Board, presenter on the New 2004 ADA Guidelines. Miami, Florida. 2005, August: Annual Association of Supportive Employment Conference, presenter on Creative Job Skills and Interview Strategies for the 21st Century. Orlando, Florida. 2005, August: Florida Department of Health Conference, presenter on Communicating Effectively with Persons with Special Needs during Emergencies. Orlando, Florida. 2005, June: 7th Annual Family Café/Family Collaboration Advocacy Friendship Empowerment Conference, presenter on Creative Job Skills and Interview Strategies for the 21st Century. Orlando, Florida. 2005, April: International Association of Rehabilitation Professionals (IARP ), coordinator of discussion on Private/Public Partnership Rehab. Orlando, Florida. 2005, March: Annual Florida Agricultural and Mechanical University (FAMU) Public Relations Conference, presenter on “Putting Others First: Communicating Effectively to Persons with Disabilities.” Tallahassee, Florida. 2004, November: Heritage Middle School Anti-Bullying/Fighting Intervention Program, presented. Deland, Florida. 2004, October: Ohio Rehabilitation Association 2004 Annual Training Conference, Bell Greve Speaker. Columbus, Ohio. 2004, May: 6th Annual Family Café/Family Collaboration Advocacy Friendship Empowerment Conference, presenter on Creative Job Skills and Interview Strategies for the 21st Century. Orlando, Florida. 2004, May: International Association of Rehabilitation Providers (IARP) International Convention, presenter. Scottsdale, Arizona. 2004, February: Emerging Workforce Conference, recruited and facilitated a Corporate Work Pane. Ft. Lauderdale, Florida. 2003, November: ADA Working Group Conference, presenter on behalf of the U.S. Access Board on New Recreational Accessibility Guidelines. Orlando, Florida. 2003, September: 3rd Annual World Congress on Disabilities Symposium, presenter on Interview Strategies for the 21st Century and Untangling the TD System. Orlando, Florida. 2003, June: Presented before the Digital Divide Council on the topic of Section 504 of the Rehabilitation Act. Tallahassee, Florida. 2003, May: 5th Annual Family Café/ Family Collaboration Advocacy Friendship Empowerment Conference, presenter on Creative Job Skills and Interview Strategies for the 21st Century. Orlando, Florida. 2002, December: Rehabilitation Services Association (RSA) Summit, invited by the Assistant Secretary of the Office of Special Education, U.S. Department of Education to participate, presenter on the reauthorization of Section 504 of the Rehabilitation Act. Washington, D.C.
2002, October: 3rd Annual World Congress on Disabilities Symposium, presented on Development and Execution of an IPE in Vocational Rehabilitation, Creative Strategies for Securing Gainful Employment, and Untangling Transportation Traps. Orlando, Florida. 2002, August: 4th Annual Florida Association for Persons in Supported Employment (APSE) Conference, presented on “It’s your Future-Take Charge Now” (addressing the rights and responsibilities of first-time job seekers). Safety Harbor (Tampa), Florida. 2002, May: 4th Annual Family Collaboration Advocacy Friendship Empowerment (CAFE) Conference, presented on How to Best Develop and Execute an Individual Plan for Employment in Collaboration with a VRS/Private Counsel. Orlando, Florida. 2001, September: 1st National Listening Session at the Ronald Reagan Building, presented on Critical Barriers Facing Persons with Disabilities. Washington, D.C.
2001, September: 3rd Annual Florida Family Care Counsel Conference (FCC), presented paper on Shaping Change In the 21st Century, with a focus on Disability Policy. Fort Lauderdale, Florida. 2001, May: 3rd Annual Governor’s Summit on Disabilities hosted by Family Collaboration Advocacy Friendship Empowerment (CAFE), presented paper on Consumer Individual Plan for Employment Development and Execution. Kissimmee, Florida. 1999, September: Able Trust Disabled Symposium, keynote presenter. Orlando, Florida. 1997, March: Florida Senate Education Committee, testified before the Florida Senate confirmation hearing for an unprecedented second term as Student Regent with Florida State University System. Tallahassee, Florida. 1996, March: Florida Senate Education Committee, testified before the Florida Senate Confirmation Board for Student Regent with Florida State University System. Tallahassee, Florida. 1995, May: Johnson Rhode Island Prevention Center Conference, keynote presenter. Johnson, Rhode Island. 1994, June: New Jersey’s Annual Conference on Disabilities and Addiction, keynote presenter. Newark, New Jersey. 1991-1994: Presented “Think First” Outreach Program. Pensacola, Florida. 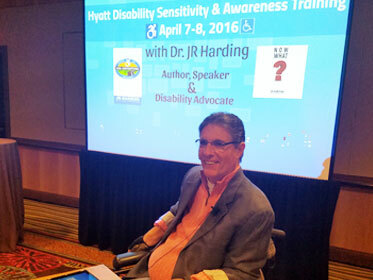 Additionally, Dr. Harding has been an Annual Presenter at National and International Conferences on Disabilities and Addiction since 1989 in locations such as Chicago, Illinois; Johnson, Rhode Island; Newark, New Jersey; Washington, D.C.; New York University in New York, New York; Pensacola, Florida; and Wright State University in Dayton, Ohio.